One place where the bears are firmly in control appears to be the Asian energy market where they have taken a big bite out Australian thermal coal and LNG producers. Thermal coal prices out of Newcastle crashed 20 per cent last week — the most precipitous dive since the global economy became completely unglued during the global financial crisis a decade ago. Newcastle coal, which is a favoured fuel of Asia's big power generators — not only in China, but Japan (the biggest market) and Korea — has now dropped 40 per cent from its peak of almost $US120 a tonne in August last year. While the Chinese customs' nebulous go-slow/ rigorous environmental inspection/ import ban has had an impact, it is a far broader problem for Australian exporters. On Refinitiv Eikon shipping data, Chinese imports of Australian thermal coal have fallen from 2 million tonnes in January, to about 1.3 million tonnes in March. The recently concluded longer term Japanese thermal coal contracts — as opposed to the spot price —also showed a marked softening, with the March 2020 contract price being cut by 14 per cent. It's not just a switch to less carbon intensive fuel. Thermal coal's closest competitor into Asian power generation, LNG, has seen its spot price crash 60 per cent in little more than 6 months. While PMIs are telling one story in Asia, perhaps energy demand has an entirely different and worrying narrative. A coal mine Rio Tinto sold for $1 is paying big dividends for some of Australia’s largest investors, including rich listers John Singleton, Alex Waislitz and former Leighton Holdings chief Wal King. The trio are shareholders in junior coal miner TerraCom, which bought Rio's Blair Athol mine in Queensland for $1 in 2016, four years after it had closed. The company has been bringing the Bowen Basin mine back to life and Mr Singleton's Bonython Coal last year underwrote TerraCom's $15 million capital raising. A new £165 million (about $218 million) coal mine, Woodhouse Colliery, has been unanimously approved by councillors in the county of Cumbria, in northwest England. The mine promises hundreds of jobs, but also protests by environmental activists. West Cumbria Mining plans to open the country’s first new deep coal mine next to the site of the former Hag colliery in Whitehaven, which closed down three decades ago. retail investors been sold a lie? ...well maybe, but according to some, not buying such stocks is going to save the planet , and feel less dirty. So the "first worlders" that are feeling uncomfortable, guilty about their lifestyles seemed to have made a collective decision not to hold and think others shouldn't, as well. Takes a lot to turn the Queen Mary around. 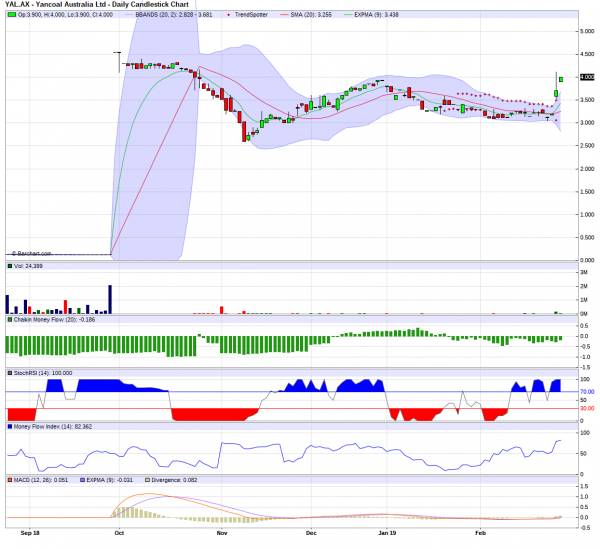 Anyone going into coal stocks for a buy and hold? The way I see it, governments around the world are running massive debts and deficits, I just can't see them transitioning over to other sources as fast as they say they will over the next 10/15 years. Coal still produces IMO, the most reliable, cost effective source of electricity. Have retail investors been sold a lie? Here's where the numbers don't quite gel with the Coalition's long-standing commitment to coal. At such huge expense, for either project to be economical — let alone both together — a large slab of our existing coal fired generators would need to be retired early. That fact was highlighted in the Tasmanian project's feasibility study, released last week. It states that "the largest single factor" influencing the viability of the project is the timing for coal fired power station shutdowns. And not just a couple. "The benefits of Marinus Link are likely to be greater than costs when approximately 7,000 MW of the National Electricity Market's present coal fired generation capacity retires, which could occur from the mid 2020's [with early retirement] to the mid 2030s [with retirement at the end of design life]," the report states. It adds this: "There are plausible circumstances where Marinus Link could be economically feasible from the mid 2020s." That's a huge amount of coal fired generation to be taken out of the system in a short space of time. According to Green Energy Markets director Tristan Edis, two previous feasibility studies into the Tasmanian project concluded it didn't make sense until well into the 2030s, because you don't need such massive battery storage unless you plan on having 50 per cent renewables in the electricity system. The federal government has committed to a 23.5 per cent renewable energy target by 2020 and has argued a 50 per cent target would result in widespread blackouts. To put the proposed 7,000 megawatt shutdowns into perspective, Victorian coal fired generators produce a little over 4,600 megawatts, NSW pumps out a little over 10,000 megawatts and Queensland a little over 8,000 megawatts. Mr Edis argues that if the Morrison government backs the Tasmanian project, it would be looking at the equivalent of a complete shutdown of Victoria's coal fired plants plus a fair whack of those in NSW. If the closures aren't forthcoming, the cable will be a multi-billion dollar-white elephant. It's a similar story with Snowy 2.0. 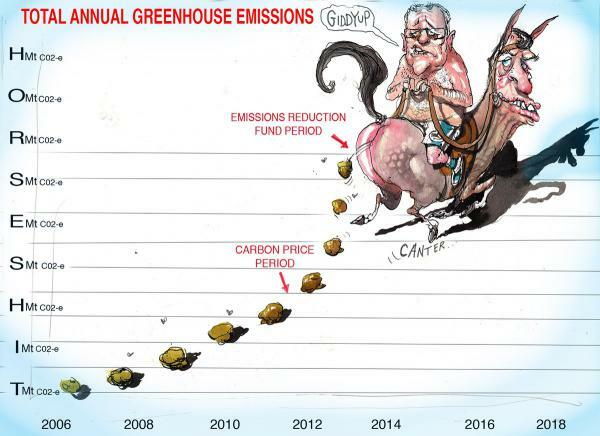 The feasibility study in that case estimated that even after the retirement of the Liddell power station in the Hunter Valley, a further three large scale coal fired plants need to be decommissioned within the next 14 years. The Australian Energy Market Operator expects three coal fired plants — Vales Point, Eraring and Yallourn — to close by no later than 2032. Combined, these produce 5,410 megawatts. That's not enough to make even the Tasmanian project viable and the time frame is way too distant. Put both projects together, and it all spells a pretty bleak outlook for coal. 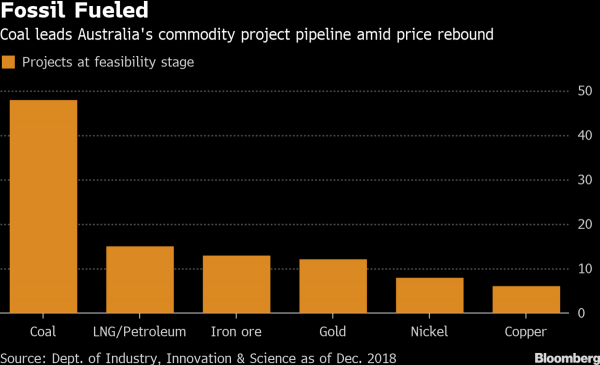 First there was a court ruling blocking a new mine on climate change grounds, then one of the world’s largest producers Glencore Plc capped output growth, and finally China was seen to be slowing down Australian imports. The developments are symptoms of the fuel’s decline and likely signal headwinds for the industry in Australia, the world’s second-biggest supplier of coal used for power generation and steel making, where the government estimates some A$70 billion ($50 billion) of new projects are in the pipeline. YAL shares shot up yesterday, on the back of their 2018 FY results. Most other coal stocks are weathering the storm - for the moment anyway. Morrison is wrong, though. Australia’s mining sector needs to feel a lot more anxious than it seems to be. Even if China wasn’t trying to send a political message to Australia, the idea that it might be cracking down on imported coal for its own reasons should be just as worrying. Exporters of high-quality coal, such as Australia, seem confident that demand will stay healthy even if some countries make heroic cuts. It’s expensive to substitute away from such coal, so they assume that nobody will ever do it. Even if there’s no immediate threat, however, such complacency is frankly misplaced. Countries that have poor quality domestic coal are going to balk at paying for expensive coal imports forever. Instead, they will start investing in coal washing, or better quality domestic plants, or will pay a premium for whatever good domestic coal there is. It is that last which is probably motivating China right now. India is actively working on a plan to end coal imports completely. The writing is on the wall for Morrison and others to read. Last week, the largest supplier of coal for international trade, Glencore Plc., promised its investors it wouldn’t increase production so as to be “resilient to regulatory, physical and operational risks related to climate change.” Financing for new coal assets is increasingly hard to come by; Indian coal miner Adani Power Ltd.’s proposed mine in Queensland is struggling to reach financial closure and nobody knows if support from Indian state-owned banks for the politically exposed company will continue beyond general elections in May. Hopeful projections for future coal-import demand depend also on the assumption that coal-based generators in countries such as China and India will increasingly switch to high calorific-value coal of the type that Australia exports. That would require actually building new plants, however, and it’s hard to see financing for those being arranged either. India is going through a banking crisis fueled in part by over-lending to the thermal-power sector. Thermal-power plants in India and elsewhere that use cheaper, low-quality coal are already struggling to compete not just with gas-fired plants but also with increasingly affordable renewable energy. Who is going to invest in a new plant that uses expensive, imported coal? Australia, which exports about 85 percent of its black coal output, should try to be realistic. One problem, as we know from the 2016 U.S. presidential election, is that coal mining makes for powerful politics as a symbol of a “strong,” job-producing economy. One commentator wrote in The Australian last week that “coal is essential to Australia’s standard of living.” While the opposition Labor party is mounting a strong challenge to the incumbent coalition government, coal-mining marginal constituencies are its Achilles heel. Yet, the best thing that can be done for the coal-export industry and all those who depend on it is to prepare for its end. Because that is, one way or another, looking inevitable. “I don’t believe for one moment this is linked to some of the higher level issues of relationships between China and the rest of the world, and including with us,” Mackenzie said. Australia’s largest coal producer, Glencore, will abandon the pursuit of large coal acquisitions and freeze production at current levels to help address climate change concerns following pressure from investors including major Australian superannuation funds for the fossil fuel to be phased out. The Swiss-based resources giant, headed by billionaire Ivan Glasenberg, says it will cap its global thermal and coking coal production at the current level of about 145 million tonnes after holding talks with the Climate Action 100+ initiative which controls $US32 trillion ($45tn) in global investment. Glencore’s Australian mines account for nearly 100m tonnes of its global volumes, underlining the impact it may have on major new mines being delivered in Queensland and NSW.